Angahara is the movement of hands and feet in a set pattern in dance. It is the sequence of karanas, graceful combination of movements of hands and feet. The origin of this movement pattern is ascribed to Lord Shiva. Bharata Muni says that angahara was first learnt by Tandu from Shiva. Tandu preached this technique to Sage Bharata. 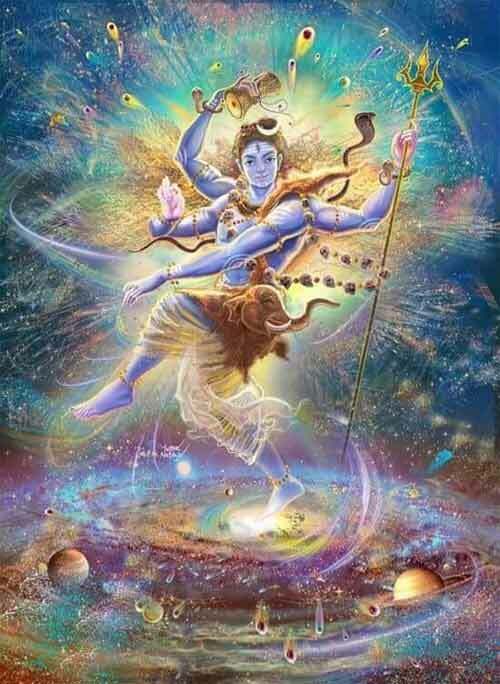 Sarangadeva refers to angahara as the bodily movements of Lord Shiva. His explanation is that this beautiful chain of movements forms a garland, and hence is called an angahara. Sangitopanishad saroddhara interprets angahara as a chain of karanas. Bharata Muni, in his Natyashastra, explains that when the hands and feet move simultaneously in a particular pattern, it results in karana, in dance. Abhinavagupta declares that hasta implies all the actions pertaining to the upper limb of the body and pada denotes the actions that pertain to the lower limb. Hence karana is said to be the graceful correlated action of all major and minor limbs. Bharata Muni describes one hundred and eight such karanas and each karana is a beautiful combination of static and dynamic states. The graceful combination of such karanas make one nrittamatraka, and three or four nritta matraka make an angahara. The Vishnudharmottara Purana gives a list of thirty-two angaharas without discussing them in detail. The names generally agree with those in Natyashastra. Natyashastra mentions that there are thirty-two angaharas but names only the first two of them. Sangita Samayasara speaks of thirty-two angahara without giving details as does. Sangita Darpana describes angaharas as one of the five nrityangas and gives thirty two of them. Sangita Ratnakara and Nritta Ratnavali divide angaharas into two separate classes, each class having sixteen angaharas in them. This classification is done on the basis of the different talas (time measures) employed. The former involves an even number of karanas and the latter involves an odd number of karanas. Nrttaratnavali of Jayasenapati, by V Raghavan, 1965, Government Manuscript Library, Chennai.